Home > Uncategorized	> Why not bored and brilliant kids? Why not bored and brilliant kids? If you’re like me you’ve been listening on public radio for the last couple of weeks to a “New Tech City” challenge called Bored and Brilliant, focused on getting people to stop checking their phones for email, twitter, and games. The idea is that “your most creative moments happen when you’re bored,” so try to let yourself be bored. The challenge ended yesterday. I liked the challenge, since I’ve been on record that I’d like to be bored for the last couple of decades (very unsuccessfully!). It’s a constant goal of mine, and I thought it was obvious that boredom creates moments of creativity. 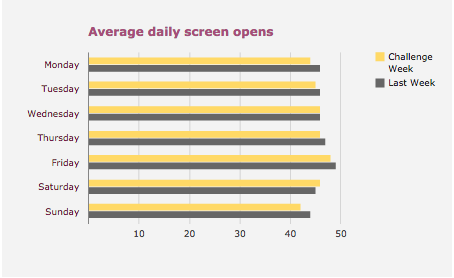 That’s not to say I don’t get addicted to games on my phone – curse you Candy Crush! – but I do delete them with regularity. And I always cherish the couple of days when I’ve lost my phone but before I get my new one. Sweet freedom! That doesn’t surprise me, but even changing people’s mind about whether it’s good to be bored is a worthy secondary goal. Which brings me to my second point, namely, why don’t we let our kids get bored if we think it’s so great? I mean, I deliberately keep my kids virtually unscheduled outside of their school and homework. To be fair I mean the older kids, who are 12 and 14. The 6-year-old still goes to after school most days, although he comes home with his 12-year-old brother on Thursdays to do absolutely nothing. But that doesn’t seem to be the general practice of most other parents nowadays, including, I’d bet, quite a few of the participants in the “Bored and Brilliant” project. What gives? After all, kids aren’t addicted to phones (yet), and they don’t have as many family responsibilities, and they do have plenty of reasons and avenues to be incredibly creative. My best moments of childhood – playing music, forming lifelong friendships, reading Dostoyevsky, and yes, experimenting with things – only happened because I was utterly without other grown-up plans. I can only think that “it depends on the kid”. As a parent, I was keen to not follow the herd and schedule every waking minute of my kids time. (I was keen to avoid becoming their slave.) The oldest (now in college) filled the time with video games mostly, but enough piano playing to become good at it. The youngest (12) is a YouTube junkie (couldn’t care less about TV), but spends hours drawing some incredible pictures. But the middle guy (16) is either totally vegging out, or out-and-about doing troublesome things and trying to stay out of trouble while doing them. Hmmm: maybe “fooling his parents” is his creative outlet. I don’t recall ever being bored as a child in the 1950s (but I had an unusual ability to create my own games and stay occupied), but I do recall people fearing that once Sesame Street et.al., came along, with its bombardment of short, quick visual takes, that children’s attention spans were being truncated, replaced with a greater need for constant changes in stimulation. Anyway, I wonder if any boredom problem on the part of young people these days, isn’t really an attention-span problem… that the digital world may well exacerbate? “your most creative moments happen when you’re bored,” That doesn’t at all corresponds to my experience. Mostly I’m bored when I’m obliged to attend to something tedious, like a boring meeting or a boring paper; and when that’s the case, there’s no opportunity to be creative. I’m not sure whether Facebook and so on have been good or bad overall for creativity. On the one hand, it’s a distraction and a time-sink. On the other hand, several of the more interesting pieces of work I’ve done in the last few years have been in response to things I’ve seen posted here or there. I certainly agree that it’s good for kids to have a lot of free time. As a fall-back, it is much easier to turn to things that feel productive or are measurable. Thus, kicking a ball in the backyard gets turned into organized soccer practice and competitive weekend away-games. Plunking on the piano gets turned into music lessons and graded performance exams. Oh, and comparison: “Your son just achieved X? my daughter just did X++” which help reinforce the cycle. Like other issues you’ve cited recently, many institutions and people benefit financially from this anxiety, so it isn’t clear there is a systematic way to call time out. I don’t equate unscheduled time with boredom, necessarily, but with being constrained to attend to something completely tedious. As far as unscheduled time for kids – bored or not – maybe kids get less of it because of safety concerns? I’m thinking here of friends who got into making homemade pyrotechnics or messed around with engines or any other machines or tools that were around. I don’t mind my kids working with tools or traveling around the neighborhood etc, as long as I know that they have the basic skills needed, but a lot of people(*) don’t seem to think that kids can learn to do anything safely. (*) “people” used intentionally instead of parents. Some restriction & scheduling of kid’s time is due to pressure from outside of family. The idea that progress is the result of boredom is the thesis of Alberto Moravia’s novel, “Boredom”, also known as “The Empty Canvas”. It’s a thought, but I have never bought it. Not progress! Except maybe unmeasurable personal progress. But no, “progress” is definitely not the same as “creativity that stems from boredom.” Almost the opposite! And I’ll gladly take it. “Boredom” is about a guy with writer’s block. But the novel starts off with the guy speculating about boredom. He says that Napoleon was bored, and so he conquered Europe, and so on. So his thesis is more encompassing than that boredom leading to creativity. But it includes it. Boredom, in his view, provides the incentive for creativity, as well as other accomplishments. How do you differentiate between the creativity that results from boredom from that that results from meditation, or from that that results from sleeping, or from that that results from conversing, or from that that results from arguing, or from that that results from singing, or from that that results from doing puzzles, or from that that results from intoxication? Etc., etc. What Ernie and kcm said. If I had kids, I’d certainly want them to have some time where they weren’t scheduled on specific activities and could choose what they want to do; and then I’d probably want to encourage them to diversify those activities somewhat — do some reading and running around outside, as well as staring at screens… I don’t think of any of that as boring, though. I definitely made up scenarios with my friends when I was little and out running around — we’d ride our bikes and shoot each other with water pistols, and pretend it was an X-Wing vs TIE Fighter dogfight, or something like that. There’s a lot of room between “virtually unscheduled” and “no unscheduled time at all.” My kids don’t have a lot of activities, but my son really likes baseball, so he plays Little League — why not? I think he has plenty of time to chill, do projects, learn magic tricks, read, whatever, even with baseball practice. If anything I think I schedule too little rather than too much. It’s a logistical pain to get piano lessons set up, but I like that I can sort of play piano and I feel a little bad that I’m not offering my kids that opportunity. You mention “playing music” as among your best moments — do most people learn to do that without their parents scheduling lessons of any kind? Did you? Women and work and housekeeping Where does all that settlement money go?